A frequent flyer? Thinking of getting a good cabin luggage bag? 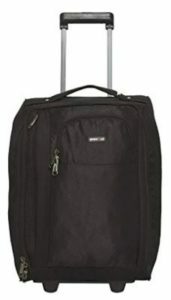 Buy BagsRUs Polyester 21 cms Black Softsided Cabin Luggage (CA111FBL) at Rs 1560. Hurry up and order before the stock runs out. How to Buy BagsRUs Polyester 21 cms Black Softsided Cabin Luggage (CA111FBL) at Rs 1560?